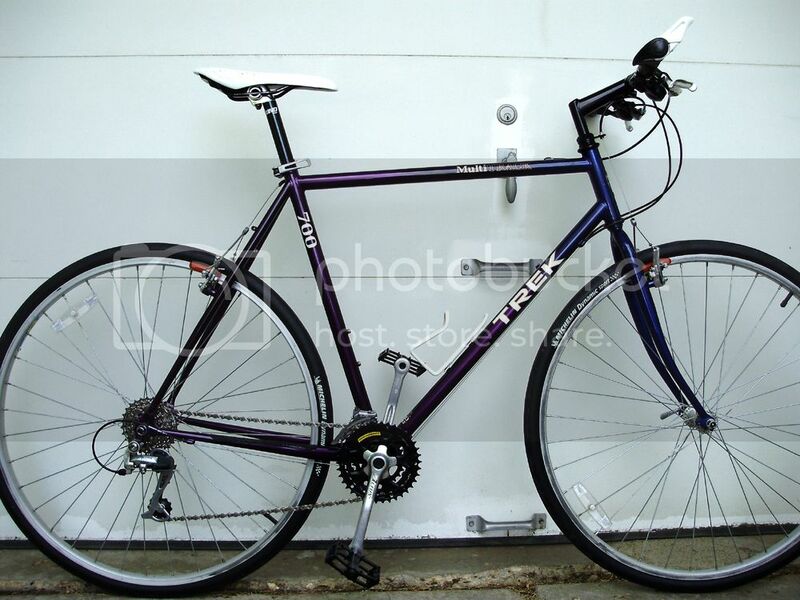 My 1997 Trek 720 Multitrack was diagnosed at the local bike shop that the crankset, cassette, and chain need to be replaced. I think the front derailer also needs replacement. I ride for fitness so I do not care that much about the weight penalty using this older & heaver bike. I checked my online cycling log that tracks my workouts and it was says there is over 5,000 miles over the last few years. Its time to replace the original components on this bike. Chain Shimano that replaced original Sachs PC-10, 1/2 x 3/32"
I can borrow the common specialized bike tools from a friend at work. Any guidance in replacement parts would be appreciated. Thanks. Nice bike, always liked that series for all around use and a decent ride. I would have a hard time to believe the crank and derailleurs all need to be replaced. I would concentrate more on the shifters, dry brake pads, cable/housing, grips, chain and cluster. I would have the derailleur hanger alignment checked. New 7 speed grip shifters are built kind of on the cheap side. unless you just have to have them I would go with shimano rapid fire style. your front derailleur should be fine and your rear derailleur maybe remove, clean and lube the pulleys. Following is the list of parts I would recommend, use and test before replacing other parts or un needed expense. If your Bottom bracket has play, replace.If not leave it alone. get the parts list and hanger aligned. add new stainless cable and lined housing. Set it up proper and roll with it. If after a couple rides you think the derailleurs are bad get in touch with me, I probably have the exact match and you can have them for free, just pay for postage. Thanks Painkiller for your insight. 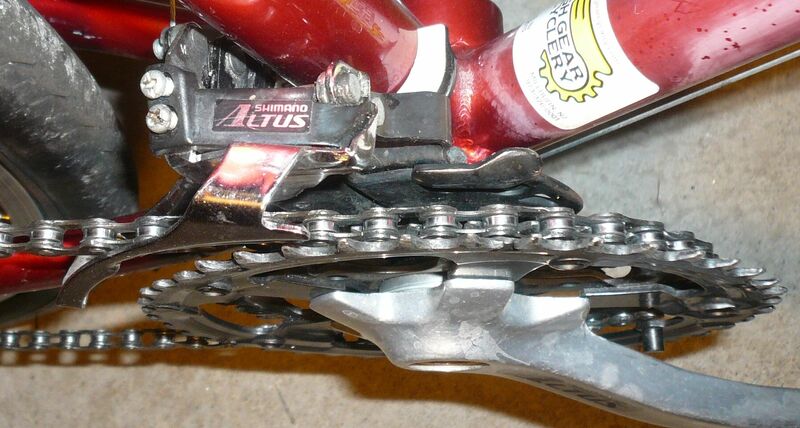 The pictures do not show it, but the chain does not full sit in all the teeth it contacts on both the front and rear gears. The chain fully sits in the gear teeth at one point but you start seeing daylight between the chain and gear teeth as you move away from that point. The front derailer has been adjusted by the local bike shop and I have tweeked the set screws too. It seems the set screw sometimes hits the internal stop but not always. This results in the chain being pushed off the chainring and greasy hands. My overall plan for the bike is rebuild it one section at a time learning some bike maintenance skills as I go. Last spring I worked started with the steering and front fork last year and that turned out good. This year I wanted to work on the drivetrain. I have planned a budget up to $150 in parts. So, if I am touch some components along the way, I would like to replace them now, rather than later. If you have suggestions for the derailers, crankset, and bottom bracket, please let me know. Thanks. As you are going to replace everything - now is the time to set it up for you, rather than off the rack. * custom 8 speed 14-32 cassette made from a Shimano 13-26T take away the 13 and 14 cogs, add a 32T from a Shimano 11-32T and a 14T Miche first position Shimano cog. * Sunlite friction thumb shifters. You have to decide what works best for you. My 720 is a commuter bike - the lowest gear 39-32 is set by the steepest hill on my ride. The 52-14 combination is for downhill with a tailwind. The custom cassette because my knees really like close ratios in the cruising range. 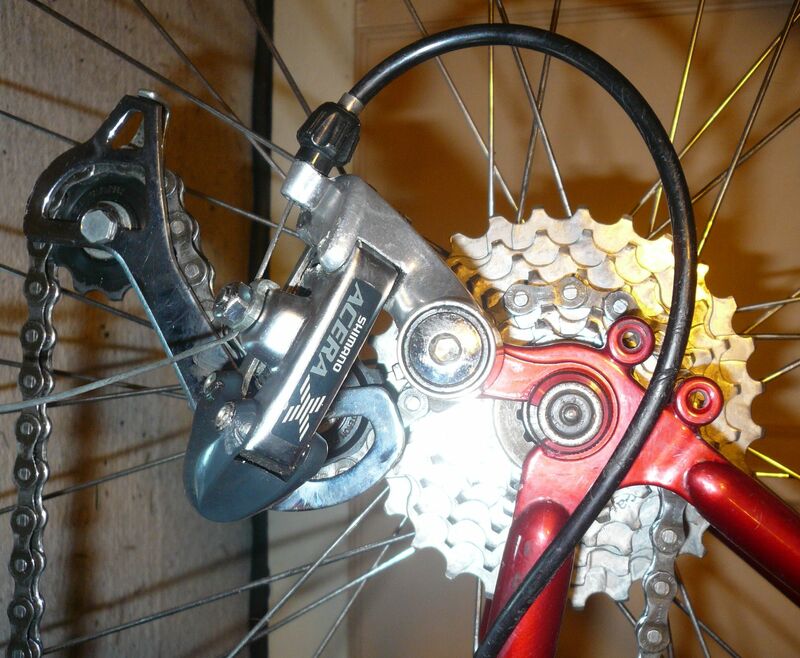 I use KMC X8.93 on all my 8 speed and less derailleur equipped bikes - the quick link is great. I buy them in 5 or 6 packs. The vintage FD just works - as well as, if not better than newer FDs on a double. The M592 was in the box, and I wanted to try it. Let me start with this. Personal definitions of types of "resto's" that retain value of a bicycle. Rule # 1. Equal to or better than original and of Era. 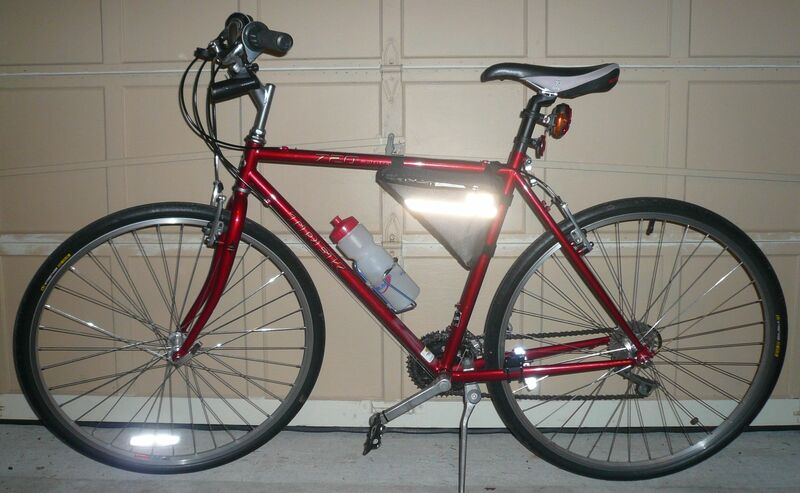 Retains the best value for bicycles that are more special or more rare. "refurbish" simply means to make the said bicycle fresh and usable again without reguard for rule number 1. "Restore" Is to put back to original spec and condition, fully functional, however, "Equal to or better than and of era" is fine in this term and will gain and or retain the best value when referring to re-sale. In the term "better than and of era" means "upgraded" not to be confused with the term "updated" which mostly means what is new and available, in your case 7 speed components that are not as nice today as when 7 speed was the norm. Hench the term (Nos) new old stock parts of era. I believe you are somewhere in between. You are not wanting to sell the bike but want a quality refurb and would like to retain as much value to bike as possible and use quality parts at the same time. You did not say whether or not you would like to try Rapidfire shifters over Gripshift or not. If you want Gripshift, I have a suitable up grade set that would require new cable and grips, very nice and in like new condition. Your Front Derailleur I believe is an E type That you have now. That can be changed out for a tube clamp style. I think your bike uses a 31.8 clamp style derailleur. I have an AceraX 31.8 front derailleur gradeA ready to go, also a compatible rear derailleur grade A no rust 90% perfect and of era. All yours just pay shipping. Pulls from a Trek 730. just clean lube and install.The free list I have includes, front and rear derailleur, 3x7 gripshifters. 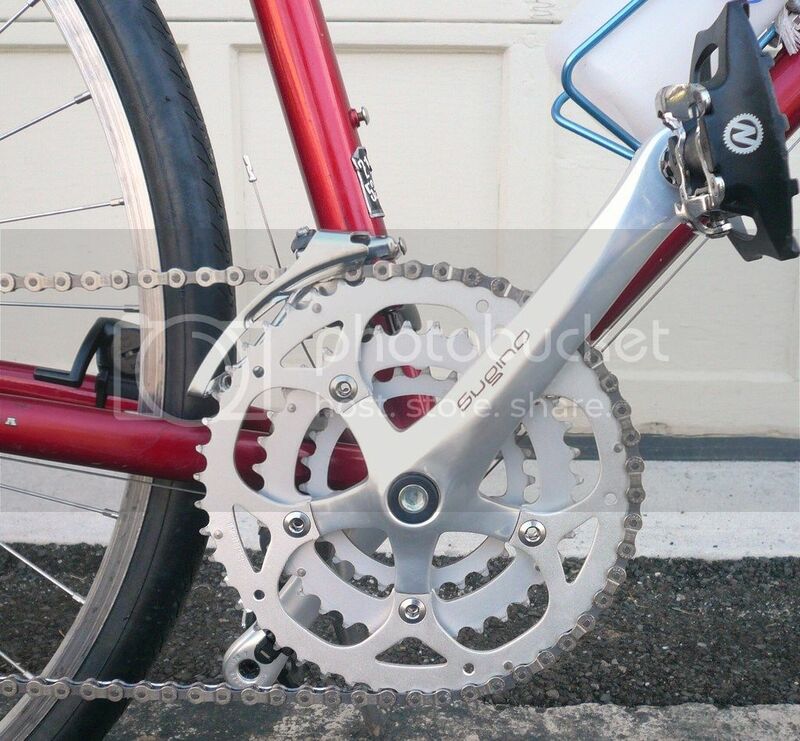 add the above mentioned Chain and cluster and that will leave you with the $$ to purchase a much nicer Crankset and matching Bottom bracket that would equal "updated and upgraded". The two main types of cranksets to choose from will be "Rivited" and "Bolted" chainrings. Bolted typically better, lighter, smoother but cost more. The Sugino XD2 JIS Road Crank Set/For Square BB/48-36-26T/175MM would be an excellent choice for a triple crankset with bolted features. here is a link, ask seller for proper BB length. That mated with the parts I will give you for shipping and the new cluster and chain, you will be Golden and in budget. That way you can put your money towards a real crankset that is lighter and smoother than you ever had on the bike. Your call there. 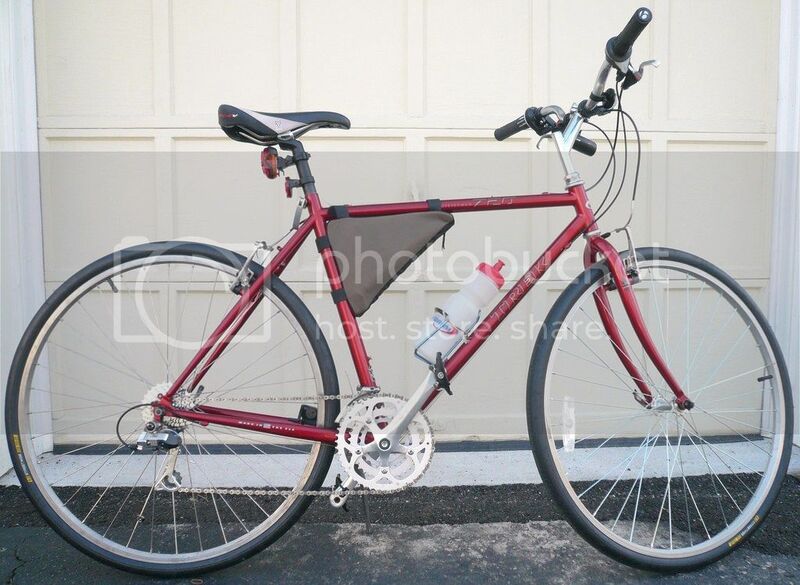 I have been doing bikes for 30yrs and If i have the parts in stock they are good, new or used. To those who need them, I give them away most of the time and this is your time, Simple as that. I have been digesting your extensive recommendations & suggestions. I think after reading what is restore/refurbish, what I am trying to do is refurbish by updating components, without regard to the the bikes value, but caring about getting a few more riding miles out of properly running bicycle. Shifters: I have no preference. I have only used the grip shifters and the kid's bike's have the rapid fire. Since you both first suggested the rapid fire first, it might make sense to go that direction. eBay has the Shimano SL-M310 3x7 rapid fire shifters for about $30 delivered. Which style would be the better update type? Front/Rear Derailer: The current front derailer on the bike is the Shimano Altus FD-CT92 which fits over/around the bottom bracket. http://www.ebay.com/itm/SHIMANO-ALTUS-FD-CT92-E-FRONT-DERAILLEUR-BB-MOUNT-MOUNTAIN-BIKE-/381493967944?hash=item58d2cffc48:m:mse0B3wWE3HiJafRKOSbYdg. I think is would be best to go with Painkillers suggestion to go with the AceraX31.8 tube clamp derailer & compatible rear derailer. Crankset: The Sugino XD2 JIS 175mm would definitely be an upgrade. 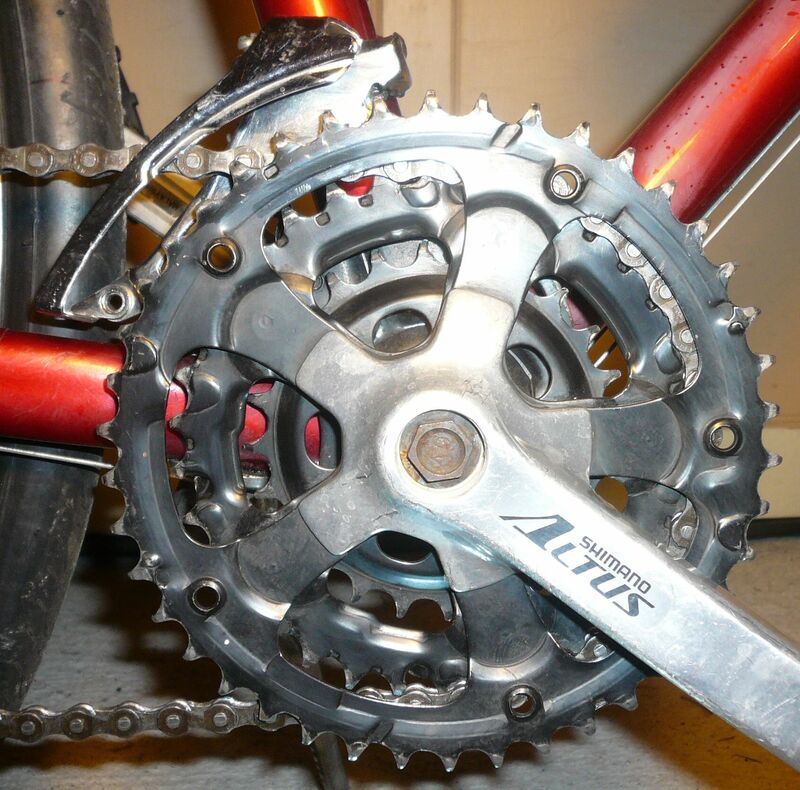 I typically ride a few steep hills and would need the three chainring gear range vs. the two gear one nfmisso suggested. Already asked about the bottom bracket length. 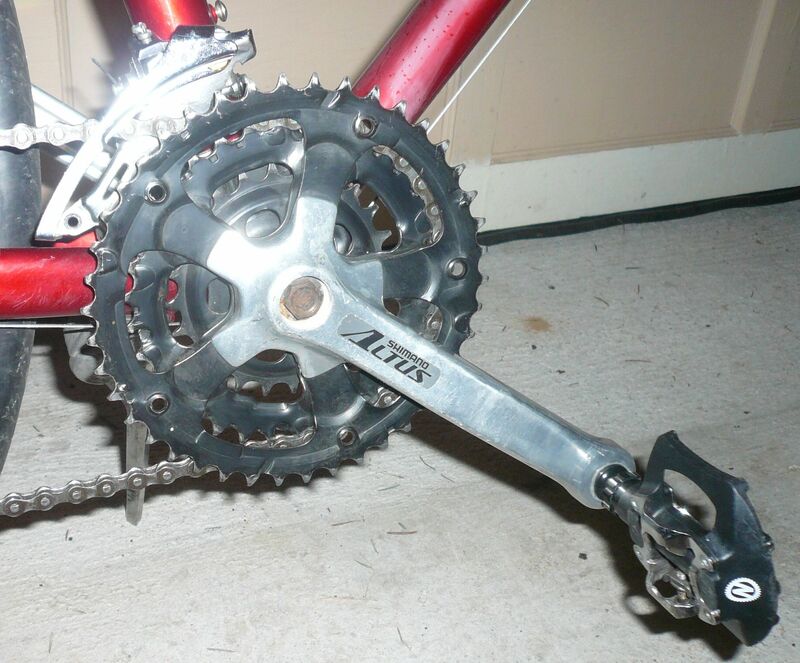 Cassette: If I had more bike maintenance experience, I might tackle what nfmisso suggests to customize an 8 speed cassette. I will pick up the Shimano CS-HG50 12-28 suggested earlier to make this easy. 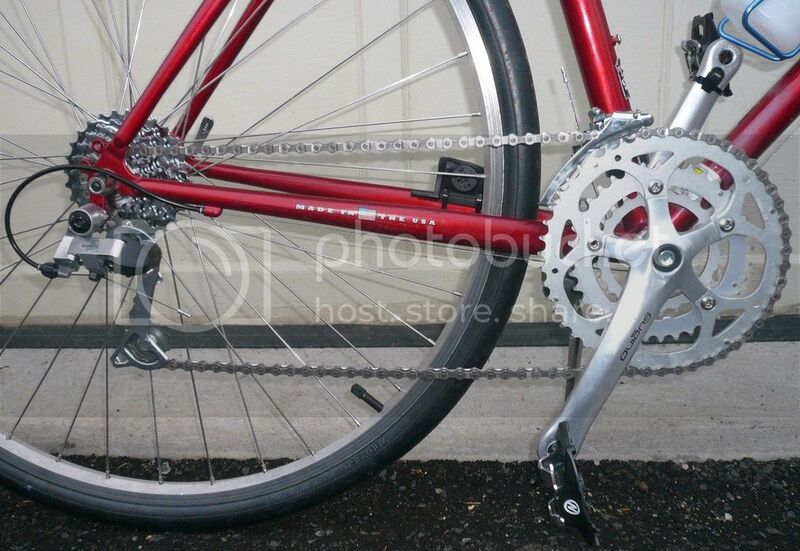 Chain: Either the KMC X8.93 or Sram PC-870. Whichever is easiest to eBay. Thank you again for all your help. I will be in contact if I have questions during the rebuild and let you know how it goes. Thanks. I did NOT suggest anything for your bike; I gave you a list of what I selected for my bike and why I choose what I did. My bike does NOT have rapid fire, nor any form of trigger or indexed shifters. It has old school infinitely adjustable friction thumb shifters - about $10- for the set. Measure your seat tube. Both of my Trek 720s have 28.6mm outside diameter seat tubes. To fit a FD designed for 31.8 would require a shim. (One of my Trek 720 is built up, the other is a bare frame & fork). 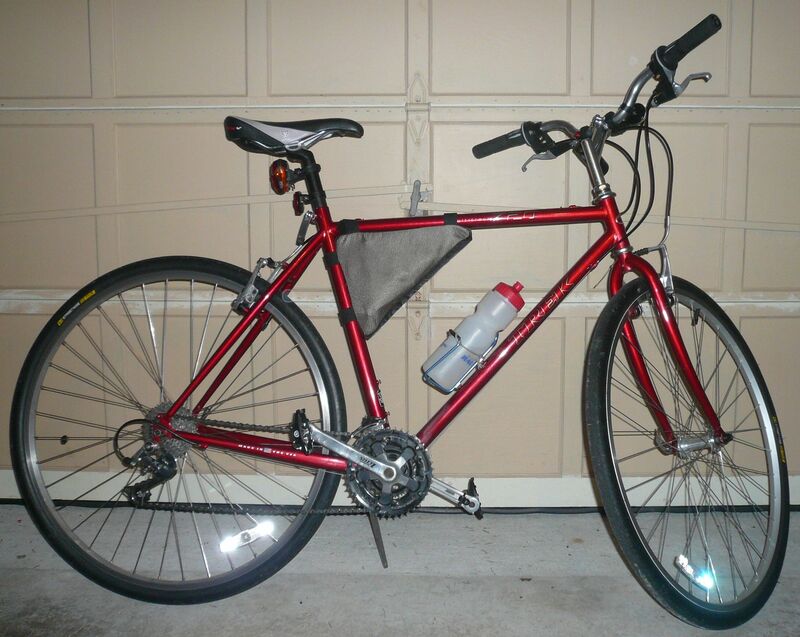 Two example's of retaining value of an older bicycle. The purple one sold a year or so ago for $310 without the seat. probably listed new around that in the 90's. 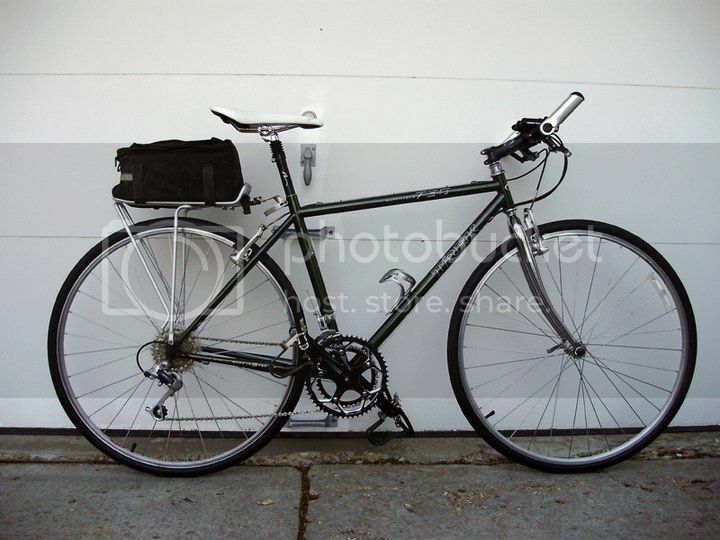 The green 730, around the same age as your Trek, sold 3 or 4 years ago for around $450 if memory serves. though well over 10 yrs old, when rebuilt up proper they still hold enough value that the money you put in is not a waste. Those two bikes look great. In a few weeks I will post another picture with the new components installed. Look forward to seeing the results. Should be pretty nice. I always liked those bikes, fun platform to work with. Additional work done was to rebuild the rear wheel hub with new 18 brand spanking new 0.25” bearings and replacing the drivetrain shifting cables. I probably spent more overall than I had planned, but what I learned in the process made up for the extra expense. Issues during the rebuild included a slightly pitted rear wheel race, getting the rear axle retightened, aligning the front derailleur, and adjusting the front derailleur. Local bike shop did not carry a replacement rear wheel bearing race but suggested that wet sanding the pitting should smooth out the race. This seems to have worked but tightening the rear race locknut took some time to get it right with no drag and no axle wiggle. Aligning the front derailleur took time, but eventually I got it parallel with the chainrings and ~2mm above the largest chainring. 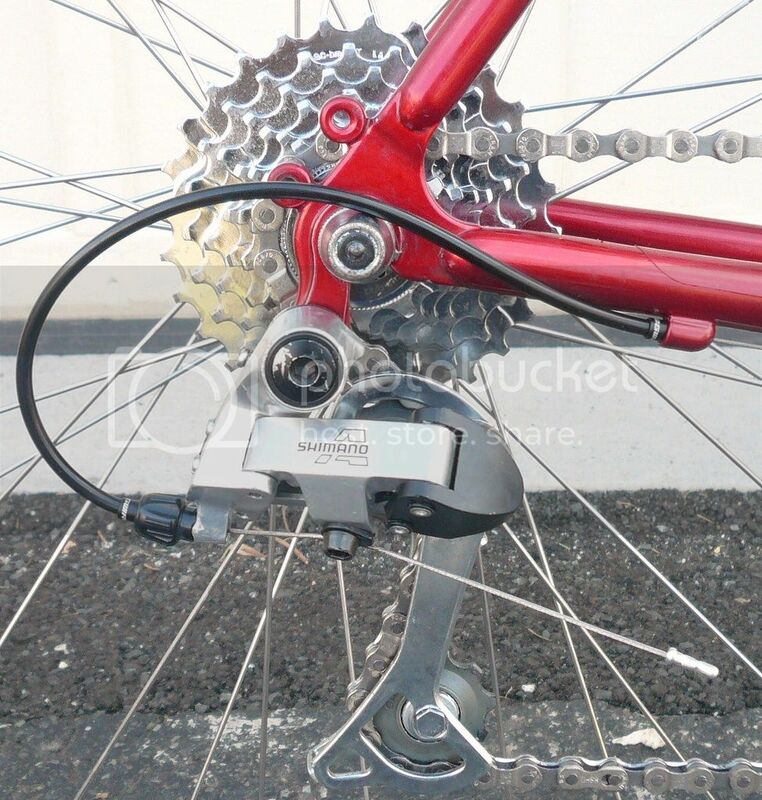 The front derailleur took time to adjust for consistent gear shifting. It appeared the front derailleur interior (where the chain goes thru) was narrower than the original, so the adjustment needed more finesse to get right. I would like to thank everyone for their input into this overhaul, with special thanks to Painkiller who helped by sharing his experience & insights with rebuilding this bicycle type. Attached are the rebuilt configuration pictures. Looks good, you knocked that out pretty fast. I may have to hire you! ha. 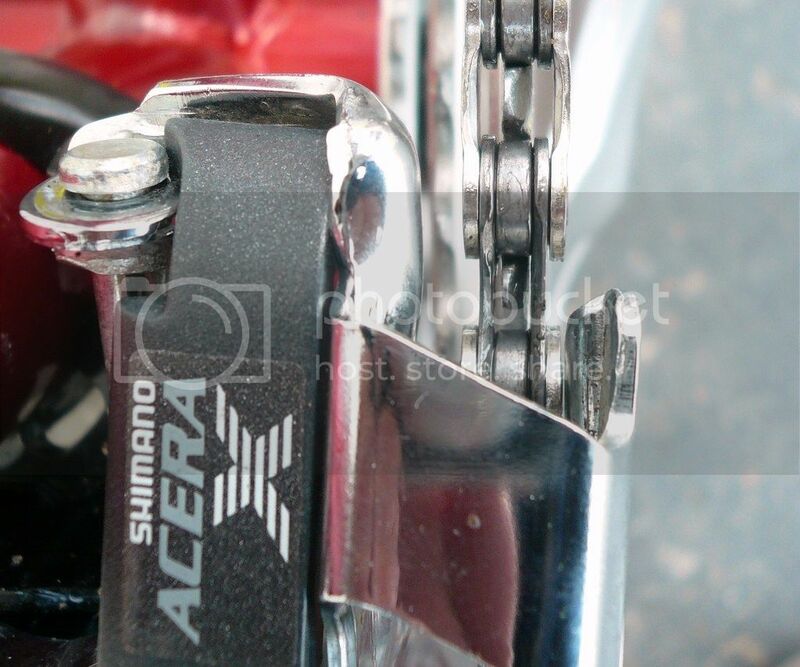 The rear Derailluer "Shimano A" as you put it is an Alivio, one up on the food chain from the AceraX you had before. Hope it all did the job for you. You should be set for awhile now I hope. Even though you were at the high end of your budget, you ended up with some quality parts, quality ride I hope. And still far cheaper than a new bike with no gain to a more quality feel Than what you built. 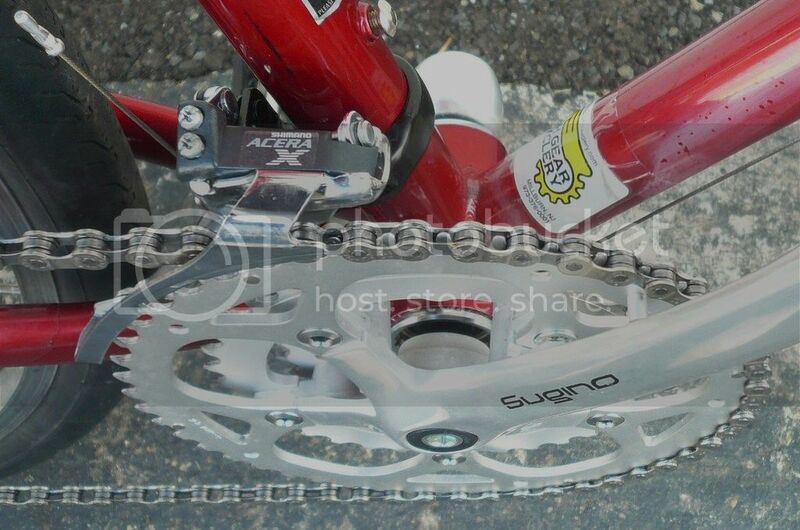 I wish Sugino had a better data base for Bottom bracket length but you seemed to have got it the way you want. Thanks for the update, nice job!